SnackTAYku Review: Pina Colada, Peanut Butter Pie and Pistachio Oreos. Over the weekend Safeway (a grocery store chain) had a fantastic sale on Oreo brand cookies for a dollar a packet, so it was a perfect opportunity to try some of the new specialty flavors they recently developed. Over the past few years Oreos have become our version of Japan’s Kitkats, with new and interesting limited edition flavors being released periodically. In the past I’ve tried their Birthday Cake, Red Velvet and Chocolate flavors. Part of the fun is trying new flavors and seeing which ones work and which ones don’t, so during the sale I picked up three recently released flavors: Pina Colada, Peanut Butter Pie and Pistachio. They are definitely a mixed bag, with some obviously a lot better than the others. First is Pina Colada. Pina Colada was only available in the ‘thins’ variety, one of the biggest scams Nabisco could come up with. Touted as ‘healthier’ thins are wafer thin cookies with a smidgen of filling, basically the antithesis of the Double Stuff. 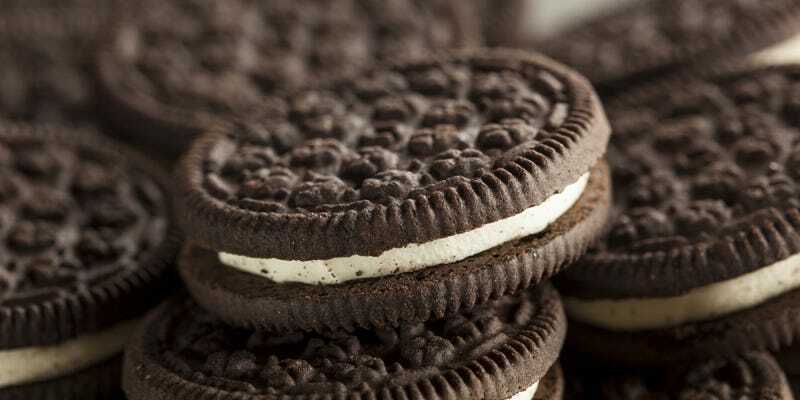 Not only are the cookies themselves not as satisfying, they are actually a lot more expensive because they are an entire 2oz smaller than the regular kind of Oreos. That lack of filling was at a real detriment to the Pina Colada flavor, as that made the flavor harder to taste. The use of Golden Oreo outside was a smart idea, as the chocolate kind would probably overwhelm the flavor even more. When you do taste the filling it’s a lot more like a pineapple flavored life saver, and very, very little coconut flavor. It’s not bad per se, but I wish the flavor was more balanced and that it was in the regular sized cookie. It seemed like wasted potential. The Pistachio flavor was better. Still the ‘thins’ variety and this time with the chocolate shell, even with the fraction of filling you could still taste it, unfortunately the flavor comes off more almond than pistachio nut since they used artificial flavoring. I still thought it tasted pretty good, and again, thought it would be better in a standard size cookie. Again, okay, but probably not a flavor I’ll be repeating. With two somewhat disappointing flavors the third flavor more than makes up for it. Called Peanut Butter Chocolate Pie flavor, the final variety is a very yummy mix of chocolate and peanut butter with a graham cracker cookie. Graham is a solid flavor for an Oreo, being less sweet than the chocolate and golden kinds, and balances well with the chocolate and peanut butter in the middle. The crème has more of the solid consistency of a Nutter Butter than the standard softer white frosting, with a similar flavor. What makes this better than a Nutter Butter cookie is the blast of chocolate that’s mixed in. I’ve had Chocolate Oreos in the past, and honestly am not all that impressed by them. The flavor is just cocoa mixed in with the regular filling, and since the shells are chocolate cookies anyway, it’s sort of lost. The chocolate in the Peanut Butter Chocolate Pie is of better quality than just cocoa crème, and since the cookie shell isn’t as sugary, the flavor comes out better. Also, unlike the others, this is in a standard cookie variety, and will definitely become a repeat buy the next time Oreos go on sale.